The multiethnic police forces after several days break have continued their patrols in Tetovo villages Celopek, Radiovce, Tenovo, Zerovjane, Bogovinje and Pirok. The police teams were accompanied by the representatives from OSCE, EU and NATO's mission "Amber Fox." According to the Media Activity Center within the governmental Coordinate Crisis Management Body, the police patrols for the first time visited Sinicane, Dolno Palciste, Gorno Sedlarce and Kamenjane villages. The situation in Tetovo region Monday morning was calm without any shootouts, as it was in Kumanovo - Lipkovo region. During Sunday night the peace has been occasionally violated with infantry weapons from the areas of town and surrounding villages. Police and army sources say sporadic and rifle shootouts have been registered from Arabati Baba Teke, Drenovec 2, Ciglana and Vonvardarska settlements as well as from the villages of Mala Recica, Trebos, Zelino, Odri, Prsovce, Celopek and Selce. Detonation has been heard late Sunday at around 23:00 hours in the eastern part of Tetovo. Police says detonation has been caused by the so-called flash-shock bomb which has been thrown from vehicle that was moving in direction to gas station Ata Petrol. In organisation of the bloc of Macedonian parties and associations from Tetovo, Monday a debate titled "Is there hope for Tetovo and Tetovo region" will be held focused on issues for full cease of armed provocations by the Albanian extremists, return of the expelled persons in their homes, return of the sovereignty and territorial integrity of the Republic of Macedonia, the reconstruction and preservation of cultural - historical and religious facilities and as well as the law on amnesty. Representatives of several political parties have confirmed their participation at the debate. In Kumanovo - Lipkovo region, some sporadic gunshots were registered Sunday by 20:00h, when more than 60 sporadic shots were fired in total of 12 occasions, coming mostly from the villages of Nikustak, Opae, Ropaljce and Bukurica county. The shootouts were not directed towards the Macedonian security forces. The ethnically mixed police units patrol through nine Lipkovo villages as planed. Twenty-five sporadic shootouts have been registered from the village of Ljuboten and Beli Bregovi - Drenov Dol locality in Skopje region late Sunday. Bombing And Shootings At Gas Stations In Tetovo Area. Tetovo, March 11 (MIA) - Sunday night around 23:00 hours flash-grenade has been thrown on gas station Ata petrol from a moving vehicle type "Wolksvagen Golf" on Tetovo - Gositvar road, Centre for Media Activity of the Coordinative Body for Crisis Management informs. The statement reads that the doers are not known and neither material damage nor injured persons are reported from the explosion of the flash-grenade. Last week Two unknown assailants opened fire at the gas station Petrol Company, on Skopje-Tetovo road. According to announcement by Crisis Management Center, the attackers wounded a gas station employee, ethnic Macedonian Cvetko Trpkovski (26). DEBATE "IS THERE HOPE FOR TETOVO AND TETOVO AREA" HELD. In organization of the Block Macedonian political parties and associations from Tetovo, a public debate was held Monday on the topic "Is there hope for Tetovo and Tetovo region." Representatives from several parliamentary and non-parliamentary parties from Macedonia took part at the debate. They all agreed that the return of the expulsed and displaced persons is necessary for the stabilization of the situation in the region as well as the willingness of the Albanian parties to implement the provisions from the Framework Agreement. Coordinator of the Block, Tomislav Stojanovski - Bombaj from the Macedonian Democratic Party, opening the public debate in Tetovo said that "the participants should not look back, but should openly as Macedonians to Macedonians speak of the future of this town and region." According to him, the primary issue "for the Macedonian part" in this moment is the adoption of the Law on amnesty to be the last allowance made to the Albanian requests. Igor Gievski, president of the Union of Young Forces of VMRO-DPMNE, speaking on behalf of the party said that Tetovo and Tetovo region have priority significance for the Macedonians, so there must be hope for this region and the ethnical cleansing of the Macedonian population should end. "Very concerning is the fact that the return of the expulsed Macedonians cannot be realized," Gievski said, adding that the Albanian extremists cannot make any more blackmails and solution should be found in order to return the displaced persons. According to him, priority must be given on restoring the cultural-historical monuments in Tetovo and Kumanovo regions, as most of them were demolished as well as the restoring of the industrial facilities with the assistance from the international community. "The Macedonian part kept its promises from the Framework Agreement, and now the requests of the expulsed persons should be met. To provide the return to their homes, to reconstruct the destroyed facilities and to provide safety for them and their properties," Gievski stressed at the end of his speech. Leader of the Liberal Party and speaker of the Macedonian Parliament Stojan Andov stressed that the Parliament has laid the grounds for realizing the most important provisions from the Framework Agreement, adding that "Tetovo is kind of observatory in which all moves will be analyzed there." "If it is not succeeded here, the whole project will fail, as it would be obvious that there is no solid ground for the agreed," Andov stressed. Regarding the recently adopted Law on amnesty, Andov believes that although it has negative sides, is a necessary instrument in building the interethnic grounds. "In order to realize these processes, as well as to stop the ethnic cleansing, it is necessary Tomislav Stojanovski - Bombaj to meet with the more important Albanian parties in order to force them to meet the provisions from the Framework Agreement," Andov said. Leader of VMRO-Macedonian Party Boris Stojmenov said that this "debate was not organized against the Albanians, but for the future of Macedonia as some ethnic communities must take the responsibility for the developments in the past period." He mentioned as largest problems the ethnic cleansing and the return of the displaced persons regardless of the fact that some solutions have been already offered. He spoke of the period of the military crisis and the moment of adoption of the Framework Agreement and asked why despite its implementation "the territorial integrity and sovereignty of Republic of Macedonia have not been restored," and why the political parties of the Albanians did not urge the Albanian population to lay the weapons. According to Stojmenov, the resolution of the crisis should have started with the Law on disarming, as according to many findings there are enormous amounts of illegal weapons in Macedonia, most of it possessed by the Albanian population. Jove Kekenovski, who spoke on behalf of VMRO-True Macedonian Reform Option, assessed the situation and the developments in Tetovo as "victims of the servile policy of the ruling parties in the past ten years." He stressed that during the implementation of the Framework Agreement the Macedonian part was the one that made the allowances, while the Albanian part gave only declarative promises that they are not for federalization of Macedonia. "The scariest thing is that the international community does not want to see the hypocrisy of the Albanian politicians, because despite the entrance of the police forces in the village, the Albanian flags are still flown," Kekeneovski said, adding that the establishment of Albanian Coordination Council is the highlight of the parallel authority of the Albanian political parties. Leader of the Democratic Alternative Vasil Tupurkovski stressed in his address at the debate that the country "has no perspective" if the "similar developments continue and if the use of weapons, the corruption, the criminal and the politicization of the education do not end." According to Tupurkovski "until the problem in Kosovo is resolved, there will be problems in Republic of Macedonia." Leader of the Democratic Union Pavle Trajanov believes that "stability and peace in the country will not be achieved until there is political wilingness for it," assessing that "the Framework Agreement has no mechanisms for providing protections for the Albanians and the other non Albanian population." He expressed his fear from the fact that "there is always danger the Albanians to take the weapons when some of their requests or conditions will not be met." According to him, ways should be found in order to take away the weapons from them and to adopt appropriate law on this issue with the participation of the European Union. Leader of MAAK - Unique Macedonian Option Straso Angelovski said that "we are here to protect the interests of the Macedonian population, because those that led Macedonia in the past years did not protect the interests of the Macedonians because they did not own strategy." "The interests of the Macedonians are not included in the Framework Agreement, and in contrast to these interests in the adopted Law on amnesty. We cannot talk only of ethnic cleansing in Tetovo, but also in the other regions such as Cair municipality where the Macedonians sell the properties and the Albanians buy them," Angelovski said at the public debate "Is there hope for Tetovo and Tetovo region. Who would believe that terrorism could blossom in the bosom of its own arch- enemy, and to make things even more horrible, pass unnoticed under its nose. That is exactly what is happening almost every day on the WNDZ-750AM radio station in Chicago, Illinois, USA during the two-hour broadcasting in Albanian, among other nationalities throughout the day. Commercials literally stating: let us finance our liberation army in Macedonia keep going on the mentioned radio station in the middle of the day in the bustling and beautiful city of Chicago, but luckily, in Albanian language. Now, to a lot of Chicagoans even if the same commercial was broadcasted in English would not have probably made more sense than the fact that some organization is trying to raise money for something, somewhere, that is all. And that is the scariest thing. People in general tend to overlook the fact that terrorism is not the final act, although that is its aim and that is where it derives its victorious pleasures. September 11th will always be remembered as a synonym of terrorism although it means a lot more than what we saw on the TV. That a lot more includes everything we have missed, everything we have overlooked, have not expected and have not believed could happen, until it happened. All THAT is terrorism, and September 11th was only the fall of the curtain. Let us not sleep through the same horrible play until it is all done. Let us act to prevent terrorism in its most innocent and dignified guises it will try to take on itself on order to win from us yet another September 11th. Tetovo, March 11 (MIA) - Macedonian Minister of Interior Ljube Boskovski considering the stabilized security situation in Tetovo municipality and according to his legal authorizations made a decision Monday to lift the curfew in Tetovo municipality, No 07 - 562/3 from November 23, 2001, which has restricted the movement of the citizens from 23.00 to 05.00h. According to the Interior Ministry, the public peace and order are not violated in greater extent in Tetovo municipality, so there is no ground for continuing the curfew in this municipality. The curfew in Tetovo was put in effect on March 17, last year, three days after the fist armed conlict in Tetovo. PARLIAMENTARY FOREIGN POLICY COMMITTEE IN SESSION. Macedonia sent a letter of protest Friday to the UN Security Council, that held an urgent session and confirmed the validity of Border Delineation Agreement between Macedonia and Yugoslavia, Macedonian Foreign Minister Slobodan Casule said Monday at a session of the parliamentary foreign policy committee. The border marking should start soon, Casule said, in a presence of representatives of Macedonia, Yugoslavia, KFOR and Kosovo local government. "The UN Security Council supported the agreement, saying that it must be respected by all, as it is apart of the UN Security Council Resolution 1244, which refers to inviolability of the borders, the Kosovo status, and the Yugoslav territorial integrity and sovereignty," Casule said referring to his participation at the Council session. During his stay in New York, Casule had meetings with representatives of the Council member countries, who said that the border issue should be closed and granted their full support to the territorial integrity and sovereignty of Macedonia. "Any challenging of the border agreement is opening of an artificial dispute that may have serious implications over Macedonia, Casule said. Despite the UN instructions to Kosovo administrator Michael Steiner, the Prime Minister of Kosovo, Bajram Rexhepi still considers that the border should be revised as it is not recognized by the Kosovo institutions. Such statements did not lead to building of stability in the region, Casule said. He said that Steiner was invited to visit Skopje and brief on future UNMIK activities in regard with the persistent discrediting of the border agreement. Casule also briefed on a meeting between representatives of the Foreign Ministry and of the OSCE, NATO and the Hague Tribunal on the recent developments in the village of Ljuboten. According to Casule, Task Force Fox was in regular patrol, while representatives of the Hague Tribunal said that their activities were agreed with the Public Prosecutor's Office of Macedonia. However, the Foreign Ministry requested additional explanation, which would be submitted on Wednesday, Casule said, adding that the Hague Tribunal has no mandate in the country, and opening of its office was a result of the Macedonia's good will. He also informed that Macedonian President Boris Trajkovski, accompanied by the Foreign and Finance Ministers, would attend the international conference for development financing in Monterey, Mexico. MACEDONIA'S FOREIGN DEBT CONTINUOUSLY REDUCES. The tendency on reducing Macedonia's foreign debt, on the grounds of using the medium-term and long-term credits and loans, has continued in January 2002 and now it is 1,357 billion and is reduced for 1,5 percent in comparison with December 2001. London Club with $ 268 million and the International Agency for Development (IDA) with $ 253 million continue to be Macedonia's greatest entrusters. The decrease of the foreign debt in January 2002, according to Macedonian Finance Ministry, comes as a result of the reduced employment of credits and loans and increased reimbursement towards the foreign creditors. Also the negative differences in the exchange rates, which amounted to 11,4 million in January have contributed towards decrease of the debts. Most of the creditors - 70 percent are official creditors and the others are private. In January 2002, only $ 4,2 million were withdrawn from the foreign creditors on the grounds of already approved credits and loans, what is $ 1,3 million less in comparison with December 2001. Most of the means, i.e. around 77 percent were withdrawn from the multilateral creditors - International Bank for Reconstruction and Development (IBRD), International Agency for Development (IDA) and the European Bank for Reconstruction and Development (EBRD). Also $ 33 million were reimbursed to the foreign creditors on the grounds of capital and interest rate, what is Denar 9 million more that in comparison with December 2001. Most of the reimbursed liabilities are towards the bilateral creditors -50,3 percent, private - 33 percent and multilateral creditors - 16,7 percent. On the basis of the retrieved means and servicing the liabilities, the net transactions or net indebtedness, which is utilization of the foreign credits and loans reduced by the reimbursement of the debt in January 2002 is 14,3 million less, and is similar to the one in December 2001, when it was $ 14 million. According to the reimbursement plan of the Macedonian National Bank, $ 139,8 million will be used for foreign debt service out of which $ 100 million are debts and $ 39,7 million are interest rates. Most of the debt service i.e. around 36 percent should be carried out in the third quarter of the year. MARKING OF 10th ANNIVERSARY OF TAKING OVER CONTROL OVER MACEDONIAN BORDER. Regarding the 10 th anniversary since the Macedonian Army has taken the control over the state border, a celebration was held at the Ramna Niva checkpoint near the border crossing of Kriva Palanka. The Chief of ARM Staff, General - Colonel Metodij Stamboliski, high ARM officials, as well as representatives of the local self - government of the municipalities of Kriva Palanka and Kumanovo attended the ceremony. Stamboliski announced that probably March 11 would be proclaimed as an official day of the Macedonian border services. In his address, the Commander of the first border brigade, General Atanas Jovcevski, said that overtaking of a border control by the ARM was a historic moment for the country. "In those important moments the Macedonian defenders stood bravely and with no compromises risked their lives to serve their country" Jovcevski said, adding that it was the beginning towards improving of the Macedonian border guard. He pointed out that at the beginning, border guards had only personal weaponry, but today the border security is under a single command, i.e. under the command of the Macedonian border brigade, which, due to the efforts of Macedonia and the assistance from foreign countries, is equipped with more sophisticated devices for border control. The former chief of the ARM Staff, General Mitre Arsovski, said that the ARM border brigade was able to protect the border. "Border guards cannot deal with difficult situations, but a whole army is behind them to defend the country's territorial integrity and sovereignty, which is its obligation according to the Constitution," Arsovski said. 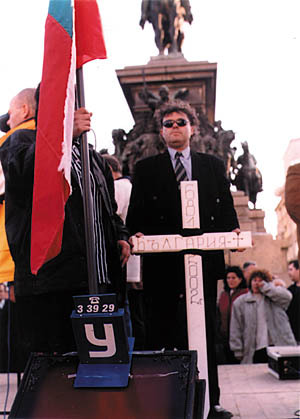 For former defense minister Trajan Gocevski, the border control is one of the most difficult matters. "The crisis in Macedonia broke off after signing of the Stabilization and Association Agreement between Macedonia and the European Union, and the Border Delineation Agreement between Macedonia and Yugoslavia. These tow documents put an end to the idea for creating of great states," Gocevski said. He expressed hope that such ideas would not be supported in this century, pointing out that Macedonia is at the right track to defend its sovereignty and to prove the validity of Macedonia-Yugoslav Border Delineation Agreement. TODAY IN BRUSSELS DONORS' CONFERENCE FOR MACEDONIA. Donors' Conference for Macedonia, organized by International Monetary Fund and World Bank is held in Brussels today, So far, 43 countries and institutions have confirmed their participation in the conference. Last year, one of the priority topics at NATO was the future of Macedonia, while adopting of an amnesty law last week, is one of the most significant element for the peace in the country, NATO Secretary General George Robertson said Monday after a meeting with Macedonian Prime Minister Ljubcho Georgievski in Brussels. Passing of the amnesty law was not easy in a time of crisis, but crucial for healing of the wounds and confidence building, Robertson said. "The main task now is continuation of the peace process, restoring of the interethnic coexistence and redeployment of the police in all regions. In this respect, NATO will assist as much as possible," Robertson said. NATO would remain to be a loyal friend to Macedonia. Last year, the Alliance stood behind the people of Macedonia through their most difficult moments, he added. Several Macedonian ministers would visit Brussels next week, for a meeting with NATO officials on reviewing of Macedonia's Action Plan for NATO membership, Robertson said. Saying that NATO Secretary Genral was one of the officials, who most frequently visited Macedonia in the last year, Georgievski expressed hope that Robertson would never again come to Macedonia to deal with problems the country had in 2001, but only to promote peace and to express his friendly feelings towards the country. The meeting, as Georgievski said, was focused on the recent developments in Macedonia. It was concluded that the state institutions met all of the obligations, which derive from the Framework Agreement, such as changing of the Constitution, and adopting of the local government and amnesty laws. "We have asked NATO to help us in fast reintegration of the territories in Macedonia, as there is no reason for the process to be slow," Georgievski said, adding that establishing of law and order in the whole country is in interest of the international community and the region. "Now, it is very important for Macedonia to be among the countries that will join NATO in the next round of the Alliance enlargement," Georgievski said, expressing belief that the country would meet all of the conditions for NATO membership until the organization Summit in Prague in November this year. Last night, Georgievski attended a supper, arranged in his honour by EU High Representative or Common Foreign and Security Policy Javier Solana. Georgievski is leading a Macedonian delegation, which arrived to Brussels late Sunday, to participate in the Donors' Conference for Macedonia. As expected, about Euro 250 million are to be gathered at this conference. The delegation is comprised of Finance Minister Nikola Gruevski, Vice-Premier Zoran Krstevski, Local Government Minister Fauk Arslani, Minister of Labor and Welfare Bedredin Ibraimi, Governor of the National Bank Ljube Trpeski. Macedonian Prime Minister and leader of VMRO-DPMNE Ljubcho Georgievski met Monday in Brussels with leader of the European People's Party (EPP) Wilfred Martens. During the meeting they shared their opinions about the situation in Macedonia and the wider region. According to MIA's special reporter, Georgievski has requested VMRO-DPMNE to obtain a status as monitor in European People's Party, and Martens agreed with that. There are 47 member-parties in the European People's Party with Christian-democratic orientation from EU member-countries and aspirant countries for EU membership. In the current composition of the European Parliament, EPP is the largest party with 232 deputies. "We are looking forward for the Donors' Conference for Macedonia, but I must say nothing may be predicted in advance, " said Reinhard Priebe, Director for the Western Balkans at the European Commission Directorate General for External Relations, at briefing regarding Donors' conference to be held to be held Tuesday. Priebe welcomed the adoption of Local Government Law, which was one of the conditions for holding of the Donor's Conference, as well as with the progress made in implementing of the Framework Agreement and passing of the Law on Amnesty. "It is very important now that Macedonia is refocusing on its integration into Europe, implementing of the Framework Agreement and its stabilization, which will be assisted by the Donors' Conference, " Priebe said. So far, 43 countries and institutions have confirmed their participation in the conference, which will be focused on three elements: macro-economic assistance for 2002, financial needs for reconstruction of the conflict-affected areas and for implementing of the Framework Agreement. Christiaan Poortman, the World Bank Regional Coordinator for SEE, expressed satisfaction that the Donors' Conference would finally take place. "The conference is to be held six months after the adoption of the Framework Agreement. However, Macedonia has been granted assistance during that period for the peace process, which are considered as part of the means that will be donated tomorrow, " Poortman said. In that respect, Poortman pointed out that the World Bank and the European Commission granted assistance in the country's reconstruction, saying that "the process is underway and will continue in the future." Priebe and Poortman consider that the Donors' Conference is within the process of Macedonia's returning to the right road, expressing their belief that the European Union would keep granting assistance to the country. Asked about the corruption control in Macedonia, that should prevent for the money of the EU and other countries taxpayers to "enter a wrong pocket", Poortman said that the corruption was not a problem for a certain country. "However, the World Bank has been already assisting to the Macedonian Government to deal with this problem, as it is one of the Macedonian authorities' priority tasks," Poortman said. Underlying that the World Bank, the International Monetary Fund and other financial institutions set only economic conditions for granting financial means, Poortman and Priebe did not exclude a possibility that some donor countries could also set political conditions. Yesterday, Poortman and Priebe met with Macedonian Vice-Premier Zoran Krstevski. Ministers of Finance, labor and Welfare, Nikola Gruevski and Bedredin Ibraimi, and Governor of the National Bank Ljube Trpeski attended the meeting. The officials defined the details of Macedonia's presentation at today's Donors' Conference, focusing on issues in which donors could be interested in, as well as the discussion that might follow the addresses of Prime Minister Ljubcho Georgievski, and of Ministers Gruevski and Ibraimi. Earlier, Gruevski had separate meetings with World Bank Executive Director Piter Steck, Director of the European Bank for Reconstruction and Development (EBRD)Jean Petrshmidth, EBRD representative in Skopje Zuzana Hargitai, and Vice-President of the European Investment Bank Ivald Novotni. The meetings were focused on realization of the projects, carried out in cooperation with those institutions. The officials also discussed a possibility for starting of new, infrastructure projects. Gruevski also met with Bishvaxit Banerjee, representative of the International Monetary Fund. The officials discussed the last year expenditures, and a possibility for meeting of Macedonia's financial needs in various spheres. Nadejda Mihailova Is The New UDF Leader. Nadejda Mihailova is the new leader of UDF. At the 13th National Conference of UDF, she was elected with 2384 votes. 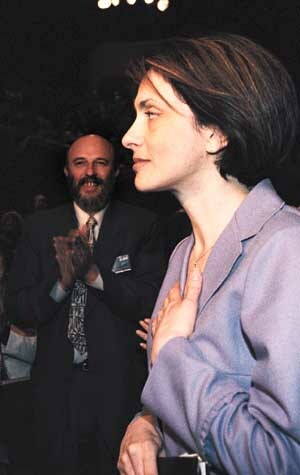 1365 of the delegates voted for the present UDF leader, Ekaterina Mihailova. 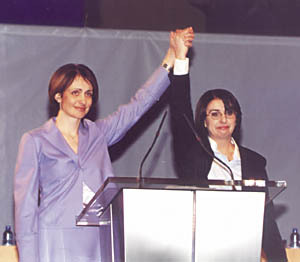 Nadejda Mihailova said for BNR, that the candidature of Ekaterina Mihailova was a very strong stimulus for her winning the elections. During the conference, the new leader of the movement declared: I hope, that when the time comes to pass on the leadership position, I will be able to stand in front of you and again have the strength and dignity to look in your eyes. I remember, only one other similar moment the moment when the visas were eliminated. I regard your support as my responsibility and I will bear it with dignity are the words of Nadejda Mihailova to the delegates in the Conference. Mihailova thanked two of the former UDF leaders, who have helped her very much to achieve the present success Philip Dimitrov and Ivan Kostov. A National Council was chosen as well, which later will choose the new management of the party.The new secretary of UDF will be Ivan Ivanov. Nadezhda: I'm Not with Bakardzhiev, Bisserov or Sofiansky. I want your trust and in return I'll will give you my strength. before the 13th National Conference of the UDF. Yesterday I heard some people speaking against clientelism, people who during all these years didn't want to fight against it. I heard people who stood against the UDF to talk about responsibility, people, who haven't ever fought a single battle were talking of courage. That's why I want to tell you some things. The first thing is that I do not side with Evgeniy Bakardzhiev. Because at the time when he was vested with power as a deputy-chairman of the UDF and a Vice-PM in the UtdDF government, I suffered some heavy blows from him and unsuccessfully tried to explain to my colleagues what kind of a person he was. I'm not with Bisserov and Tzonev, either. I'm not with Stefan Sofiansky, because if I looked for the easy way I would have formed a successive economic lobby inside or outside of the UDF. I'm not with the NMS, because if I wanted to betray the UDF, I would have done it when the NMS were at peak of their popularity. I believe that the UDF doesn't simply need a change of its leader. It needs an overhaul. The conference could give strength to effect these changes. I'm not seeking power, because the party is in a difficult situation and there's no power. I'm not searching for popularity. Because I know how volatile it is. I don't want and will not become a leader at all costs. Whatever you may decide, in my soul I'll always remain a part of the UDF. I want your trust and I'll give you my strength. If you believe me then help me. Let's give the UDF back to Bulgaria and its citizens. In Me People Saw a Sign of Changes. - Mrs. Mihaylova, what will be your first words to the delegates? - Thanks a lot to everybody - both to those who voted for me, and the others, who voted for Ekaterina Mihaylova. Thanks to the colleagues who were next to me in the hard days before the forum. - What are your priorities? - There's a principal element in each choice. People wanted to find some sign of change and may be they found it in me. I myself found a really strong moral support in the colleagues, who were next to me during the last days. Foreign Minister Passy Discusses Support for NATO Membership with Ambassadors and Former President Peter Stoyanov. Washington, March 11 (BTA spec. corr. Roumyana Kinkina) - Another meeting of the foreign ministers of Greece, Turkey, Bulgaria and Romania is being planned for March 29 in Athens. Three of the countries have already confirmed their participation, Bulgarian Foreign Minister Solomon Passy told Bulgarian reporters after having dinner with six ambassadors which was also attended by former president Peter Stoyanov. Foreign Minister Passy, who is paying a visit to the US from March 9 through 13, had dinner at the Bulgarian Embassy in Washington on Sunday evening with the ambassadors of Greece, Turkey, Romania, Hungary, Italy and Spain. The dinner was also attended by former president Peter Stoyanov who is lecturing in the US for three months at the invitation of the German Marshall Fund. The dinner, organized in honour of Passy's visit to the US, was also attended by representatives of the Foreign Relations Committee of the US Senate, of the German Marshall Fund, of the American Jewish Committee and of B'nai-B'rith. After the dinner Passy and Stoyanov met Bulgarian reporters covering the visit. The dinner discussed possibilities for supporting NATO enlargement in the format Greece and Turkey support Bulgaria and Romania, Passy said. Peter Stoyanov said he would avail himself of his three-month stay in the US to actively lobby for Bulgaria's bid to join NATO, he and Foreign Minister Passy agreed on joint actions to this end. The situations is quite favourable for enlarging the Alliance by seven more countries, Stoyanov said. According to him, enlargement by the formula seven plus two is also possible. Stoyanov declined to comment on domestic policies in Bulgaria. "All I can say is that any political disturbances would affect the attitude to Bulgaria and it would be better if nothing unpredictable happens in the runup to the NATO summit in Prague," the former Bulgarian president said. USA - BULGARIA - BUSH. US President Bush Lauds Bulgaria's Support for Anti-Terrorist Coalition. New York, March 11 (BTA Special Correspondent Roumyana Kinkina) - US President George W. Bush praised Bulgaria's support in the anti-terrorist coalition during a brief conversation with Bulgarian Foreign Minister Solomon Passy. Passy arrived on a visit to the United States on Saturday. The Bulgarian Foreign Minister attended the commemorative ceremony for the victims of the September 11 terror attacks against the United States. After addressing the ceremony Bush went to congratulate the participants and Passy introduced himself, saying that he was there to show Bulgaria is part of the international anti-terrorist coalition. "Bulgaria is a firm ally of the United States," Passy said. The Bulgarian national flag was among the national flags hoisted during the commemoration. Passy also greeted US President National Security Advisor Condoleeza Rice and said he was pleased to have talked with President Bush. Passy also conveyed greetings from Bulgarian President Georgi Purvanov and Prime Minister Simeon Saxe-Coburg-Gotha to the US President. Parvanov Insists on More Authorities for the Mayors. President Georgy Parvanov will insist the authorities of the mayors to be extended, this is what became clear yesterday after his meeting with mayor of Plovdiv Dr. Ivan Chomakov. Under the present legislation the authorities of the mayors are much less than their responsibilities and this should be changed, Georgy Parvanov said. Before his meeting with Chomakov the president said that he was very worried by the tension in the country. Political destabilization at this moment would have dramatic consequences for Bulgaria. I hope that the PM, the chairmen of the National Assembly and the parliamentary group will succeed in stabilizing of the situation in the ruling group, the Head of State said. He refused to elaborate if there would be early elections. In his speech in front of the Monument of Gratitude in Plovdiv the President stressed that by saving its Jews Bulgaria taught the world a history lesson. Ambassador of Israel to Bulgaria Emmanuel Ziesmann thanked all the Bulgarians for saving his fellow-countrymen 59 years ago and called this act the '20th century miracle'. Amnesty for NMS Splinter Group. If our colleagues, who handed in resignations, admit their mistakes and repent, we may vote for their return, said yesterday Dr. Aleko Kjurktchiev, MP of NMS. In his opinion, the splintered-off MPs should take their place in the parliamentary group whose tickets brought them to the parliament. The NMS parliamentary group must hold a vote to decide if they want them back in their ranks, commented front-men of the NMS. Applications for re-entry will be accepted even from Stella Bankova and Elka Anastassova, regardless of the fact that the Premier personally asked them to leave the Parliament. The two ladies have a chance to get absolution from the PM, commented their colleagues. They are sure that there is no break-up in their relationships, only a clash of positions and opinions. Splinter Groups Have No Right To PGs of Their Own. The MPs, who left the NMS PG, will not be able to form a parliamentary group of their own, even if their number increases to 10. This is the minimum for the establishment of a new PG, jurists elaborated. According to the standing order, however, the new formation could be set up only if there's a representative of a party or movement that took part in the elections as an independent formation. Elka Anastassova and Stela Bankova said that for now they would be independent deputies. Their only option to join any of the PGs was the UtdDF, for the MRF would not let them in, not to spoil the relationships with the NMS. CITUB Threatens Cabinet with National Strike. The Confederation of the Independent Syndicates in Bulgaria (CITUB) will not sign an agreement for cooperation with the cabinet. Yesterday, it transpired that the Coordination Council of the trade union is denying authority to its Chairman Zheliazko Hristov to sign the agreement proposed by the cabinet. If no agreement is reached by end-March, the CITUB is to call for a national strike, the trade unionists maintain. To the Council, a plan for particular economic and social measures with fixed terms should be adopted along with the agreement. MRF Hesitates to Veto the Privatization. MPs from the parliamentary group of MRF aren't unanimous when it comes to the Privatization Act. Our opinions differ, next week we'll decide how to vote, MP from MRF Emel Etem said before the BNR. Later she elaborated before 'Standart' that as a whole the group wouldn't oppose to the MPs from the NMS, who insist that despite the veto of the president the act should be adopted without any amendments. The document would be voted unchanged, deputy chairman of the economic commission Yunal Tassim said. India to Buy out Nuclear Reactor in Belene NPP. Europe presses the sellout as the reactor was reportedly fraught with danger. The cabinet is conducting negotiations with India to sell out a 1000-megawatt reactor in Belene Nuclear Power Plant (NPP), said Alexander Philipov, NMS deputy for Pleven. The deal is carried out under the pressure of nuclear experts from the EU. To them, the reactor was not reliable. It was produced 12 years ago by the Skoda plants ufter a Russian blueprint and was kept in a metal jacket. "Possibly, the equipment will be replaced with another, of lower capacity," Petar Simeonov, manager of the Belene NPP, thinks. To him, there is a technical option that part of the frozen equipment could work with 600 megawatts. The price, however, will be too high for the tax-payers and it could be done only after a thorough expert consideration. "The 1000-megawatt reactor is a thousand times more profitable for the power system of Bulgaria," Simeonov maintains. A meeting of Prime-Minister Simeon Saxe-Coburg-Gotha was fixed with representatives of ministries to decide if the further building of the Belene NPP should be carried on, Alexander Philipov elaborated. Veto - Red Light to Power-Vested. There is no time to re-write Privatization Act, but some amendments are due. The new philosophy of privatization showed symptoms of a serious malaise - total disregard of social aspects of the process. The sale of the state assets differs from liquidation of unprofitable corporations. And to the economic team of the government the presidential veto came as something painful. Now, the actions the government and parliamentary majority might take can develop according to several scenarios. The emotional response would most inappropriate. And signs of it has already become evident. Maybe it will not be all that difficult to get 121 votes and vote anew for the original text of the Act. But that would be estimated as a demonstration of disrespect to the presidential institution. And rather infantile from the legislative point of view. Anyway, social policy is the Achilles' heel of the NMS. Raising additional possibilities for unemployment growth may entail unforeseeable consequences for the whole cabinet. Maybe, the Act must be overhauled. The major amendments will take at least several months and strenuous efforts. Having in mind that the revenues from the monopolies are a substantial item in this year's budget, the long delay may cost it serious damage. Thing are interwoven - it has bearing on our agreements with IMF, EU negotiations and accession to NATO. So, to re-write the Act is hardly possible. Partial amendment would be the best solution. If the workers are given a chance to take part in denationalization under favorable terms, it will send a clear social message. The proposal to allot part of the revenues from privatization for social programs is not to be underestimated either. To discriminate mass privatization vouchers seems unjust, too. To make haste when the legislative basis is vulnerable is worse than suspending the sales. Farmers to Plant Cotton This Spring For First Time in Years. Dobrich (Northeastern Bulgaria), March 11 (BTA) - Farmers in Dobroudja may plant cotton this spring for the first time in many years. They will use a credit line of 55,000 leva extended by the Zemedelie (Agriculture) State Fund, the local directorate of the Fund said. The funds will be extended in two tranches - a 10 lev per hectare subsidy for seeds and a 40 leva subsidy per hectare for preparations. The second tranche will be for ready produce - 0.03 leva per kilo of submitted cotton, the maximum yield per hectare being 835 kilos. Cotton was grown in Dobroudja in the early 1940s but despite the recent drought it is no serious alternative to the traditionally grown grain crops, says Valentin Baychev, head of the Wheat Selection section of the Dobroudja Institute of Agriculture. 6,000 to Get Jobs under Beautiful Bulgaria Project this Year. Sofia, March 11 (BTA) - A memorandum on extension of the Beautiful Bulgaria Project activities in 24 municipalities was signed Monday by Deputy Prime Minister and Labour and Social Policy Minister Lidia Shouleva and UN Development Programme (UNDP) Resident Representative Marta Ruedas. The 24 municipalities have been selected by a competitive procedure because the project has limited financial resources this year and has to focus its activities so as to maximize their effect. Shouleva's Ministry said in a press release that the principal selection criteria were a 50 per cent co-financing of the project costs within the municipal territory and an emphasis on activities targeting enhancement of the tourism potential. The Ministry's object is that the Beautiful Bulgaria Project be used as a mechanism for creation not only of temporary jobs but also of conditions favourable for permanent employment in the tourist industry. The extension of the programme because possible after 10 million leva were budgeted for 2002 within this year's National Plan of Action for Employment. More than 6 million leva of these will be spent on financing the commitments assumed under the project last year, and some 4 million leva will go for additional activities in the 24 municipalities involved. Together with the money allocated by the municipalities and the UNDP, the total budget of the Beautiful Bulgaria Project this year adds up to 17 million leva-plus, and they will be spent in 42 municipalities across Bulgaria. This year the Programme is expected to provide temporary employment to some 6,000 people, and 25 per cent of them may get permanent jobs. Twenty-one hundred people will be trained in skills for provision of tourist services and construction. More than 200 sites, most of them related to tourism, will be repaired. The Beautiful Bulgaria Project started in 1998. Its prime objective is to create temporary jobs, mainly for long-term unemployed, in refurbishment of buildings, parks and squares within the territory of select municipalities. 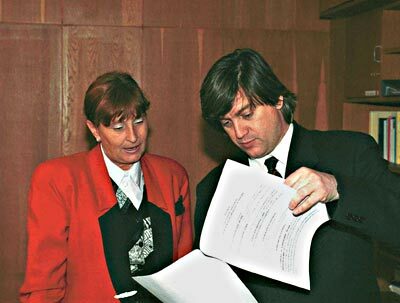 Since 1998, the Beautiful Bulgaria Project has received a total of 30 milliuon US dollars from various national and international sources, including the Bulgarian Government, the municipalities involved, the European Union, the governments of Switzerland, the Netherlands, Spain, Britain, Canada, the UNDP, and British non-governmental organization Hadley Trust. Until the end of this year, the Project will have created more than 29,000 temporary jobs and will have repaired over 1,000 sites, the Labour and Social Policy Ministry says in its press release. Athens, March 11 (BTA) - The Greek news agency ANA quoted the Hellenic Telecommunications Organization (OTE) on Monday as repeating its denial of wrongdoing in connection with a Bulgarian state tender, countering a newspaper's allegations to the contrary. The Kathimerini newspaper again claimed that OTE had rigged the outcome of a Bulgarian state tender with another bidder, Telecom Italia Mobile (TIM), in the wake of a similar report last week. OTE's management charged that the aim of the newspaper's reports was to hurt the company by presenting it in a damaging light. Documents used by the newspaper to support its case of wrongdoing in the tender in reality derived from attempts by the two firms to resolve financial differences dating back to 1996. An audit commissioned by OTE's management that was conducted by Ernst & Young and Arther Andersen showed that no payments had been made to Telecom Italia between January 1, 2000 and January 31, 2002, beyond regular two-monthly clearances of mobile phone bills to Stet Hellas. The OTE management states that all legal measures will be taken to put an end to such slanderous claims, to find out the truth and to protect the reputation and interests of the telecom and of its shareholders. BG Will Say "goodbye" to EU, if State Is Not Chaged. Bulgaria Has All Grounds to Step up EU Negotiations. 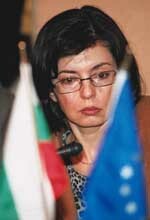 There is a crying need for changes in the state, maintains Chief EU Negotiator for Bulgaria, Meglena Kouneva. - Mrs. Kouneva, EU Enlargement Commissioner Guenter Verheugen openly declared on March 4 in Maastricht that EU should not protract the negotiations with Bulgaria and Romania. - Such encouraging remarks were also voiced at the summit in Laaken. However, it sounded different this time, because in his statement Commissioner Verheugen in very clear terms stressed that Bulgaria has made unexpectedly remarkable progress in the negotiations with the EU. The result - 8 open chapters and 4, closed - is the best from the start of the negotiations. Our immediate goal now is to open, as soon as possible, the two remaining chapters - "Agriculture" and "International and Monetary Union". In itself, the opening of all chapters will signify that Bulgaria is working actively in all spheres of economic, political and social life. - In the EU report on Bulgaria for 2001 there were critical assessments as regards the state of our economy, state administration and judicial system. What progress have we made and what is yet to be done in these spheres? - We have a well-developed strategy, which has all chances to work efficiently. In the last decade, no one dared to come out with a strategy for this exceptionally difficult sphere. It requires changes, be it in a strictly material terms or amendments to the Constitution. As regards real change in economy - this is a very broad issue. In the cabinet everyone has his own responsibility in the process of negotiations. This is a process that undoubtedly asks for team work. It comes to a real change in the whole country, not just a stack of papers that we bring over to Brussels. If we fail to make this change, we shall never become part of the EU. - You represent the government in the European Convent - the new body that will outline the future of the EU. What can Bulgaria benefit from joining the Convent? - The fact that Bulgaria has joined the Convent is the clearest evidence that the process of Bulgaria's EU accession is irreversible. - Mrs. Kouneva, Bulgaria has signed a contract with "Crown Agents" which stirred up suspicions that the EU may cut off financing for our customs houses. Some tend to see this contract as an admission of the inability of the state to cope with the control of this institution independently. What is the truth actually? - Apparently, the Ministry of Finance aims to boost revenues from the customs. In March we are planning a series of new consultations on the "Customs Union" chapter. Most probably, the Commission will wish to see how the contract is functioning. It's a matter of a very delicate balance in our national interests. Bulgaria is interested in getting higher revenues from the customs. Ivan Garelov Makes Start in Top TV. The private TV hopes that the numbers of its audience will increase. Former anchorman of 'Panorama' Ivan Garelov starts working for the cable Top TV, 'Standart' learnt. At the moment Mister 'Panorama' negotiates with owner of the TV Nikolay Yonkov. It is expected that the negotiations will finish within several days. To well-informed sources, the popular TV anchorman will take up the role of a program director. At the same time he'll host a political review. It's not clear if this program, which is similar to 'Panorama' and Studio Nova, would be televised on Friday or Saturday.